Is the world ready for Alpha One? There are of course hundreds of supposed sightings of UFO's every year and vast majority are considered to be either fake, explained natural earthly phenomena, or easily explained with a rational explanation. Some though remain unexplained and some potentially covered up. ..
Officially the US Department of Defense are no longer investigating these matters. Unofficially is another matter; a theory which is of course supported by the vast number of rumours, denials and speculation about Area 51 in the Nevada desert. We may never find out what goes on within the confines of Groom Lake or the Nevada Test and Training Range. So for now, nothing official is being done about this. No-one is investigating and cataloguing these sightings. But why does this have to be orchestrated by a national government, surely resources could be put together to establish a worldwide research facility that did just that, research worldwide UFO sightings. And the results, good bad or indifferent, there would be no cover up, they could be published instantly for the whole world to see, This would be a little like the Seti Institute in is composition, but rather than search for extra terrestrials out there, we would be searching for evidence of them having been here. 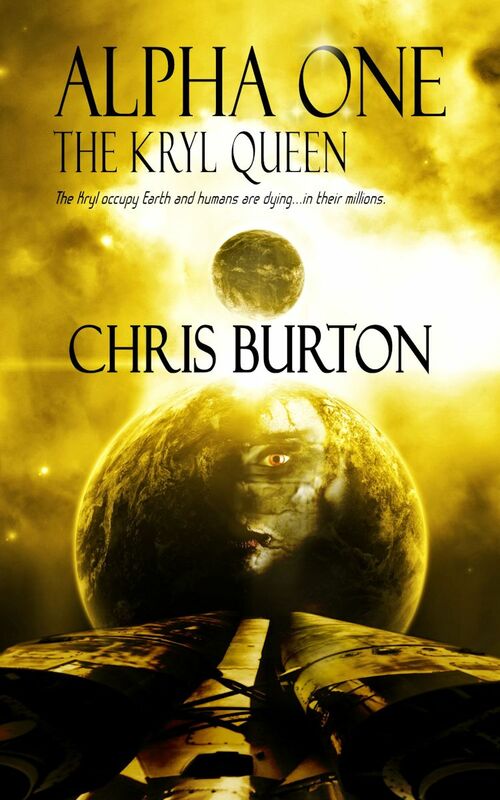 The Kryl occupy Earth and humans are dying... in their millions. The final part of the first Alpha One Trilogy brings the Kryl and Alpha together in a desperate battle spreading light years across the cosmos. The only hope for mankind, a small contingency fleet heads for the Styros Cluster to lie in wait, in hope that Earth’s scientists can find a way to destroy the Kryl. On Earth, as Alpha’s leaders go into hiding, President Roslyn has no choice but to comply with the Kryl agreement. Every three months, one hundred million humans must die. As Admiral Jonathan Hoskins and his fleet return to Earth in readiness for battle with The Kryl, Jake Carter knows his destiny is to see the Kryl Queen once again, but not before the ultimate Kryl destroyer weapon is deployed. With Carla Stevenson a reluctant guest of the Kryl Queen, Jake must show his new found command experience to bring the Halo 7 home, to Carla and to his destiny. Thirty-five minutes later, the doors to the next chamber opened and two Kryl guards stepped inside. The doors were now held in an open position and Muller could see what lay ahead. A large rectangular shaped room, with a transparent partition segregating the humans from the slowly filling auditorium. Already over a hundred Kryl had gathered. It seemed that their deaths would fulfil both the feeding and the entertainment for these Kryl. He looked on in disbelief and immediately hated every single one of them. Now the guards stood to one side and gestured for the humans to enter the chamber. Within thirty seconds all twenty-five humans had moved into the new room, their brief resistance now over. Total acceptance had taken control. Muller moved right to the end of the chamber and stood transfixed as the now full Kryl auditorium stared back at him. Satisfied that there work was now done, the Kryl guards stepped back inside the waiting room and the door shut. Several moments passed before anything happened... A mild tingling sensation in the back of Muller’s neck indicated the process may well have started. He looked ahead and could see that the majority of Kryl had their eyes closed; obviously deep in concentration. He looked to his left and saw several of the older humans begin to sway, unsteady on their feet. They would not last long, he thought. Now there was a dull ache streaming up from the middle of his back to his neck. Something was definitely going on here. He looked across again, as he heard a thump. One of the elderly woman had just fallen to the floor. No-one helped her. They were all concentrating on their own fate. Another thud and then another as two more people collapsed. Jake could feel it in his legs now, a dull ache spreading through his muscles. The pain in his neck had started to intensify and he found himself wincing as the each new wave of pain hit him. He looked up at the Kryl audience. They remained passive, no noise, just concentration. They were slowly killing him. Two, three and then four more people collapsed. From the corner of his eye, he could see the first woman to fall, was now sobbing. There was a trickle of blood running from her ear and her eyes were bloodshot. Now, there was screaming... high pitched screaming from man and women alike. He was definitely in trouble now. He felt weakness crawling at his body. His eyesight was beginning to fail and his mouth was dry, dry as sandpaper. The screaming had intensified now. Most of his fellow humans had fallen to the floor. They were all dying. And yet, his mind felt as lucid as ever; almost as if the failure of his other senses, and his motor neurone functions had freed his brain. Images flashed past of memories long since lost. Was this his life flashing before him, before he died? Another glance across, only five people now stood standing. Looking down he saw the woman, who was now quite clearly dead, blood oozing from her mouth, nose and ears and a huge crack, exposing her skull at the top of her forehead. The screaming had died down now, replaced by whimpering and sobbing from those who remained conscious enough to notice the pain. Muller needed to hang on. This was not a competition and yet as leader of this motley crew, he wanted to be the last to fall. This last great challenge was all he had left. He was the last man standing. All twenty-four of his companions had now fallen and now there was silence as he felt a warm liquid run down the side of his neck. And yet he still stood. He would not fall. He would stand forever if only metaphorically. His legs finally gave way and he too fell to the floor and huddled in a foetal position, no longer able to control the pain. His mind still raged, but his thoughts became softer, more emotional. He thought of his family, his daughter, even his ex-wife. Would they be ok? He was sure they would. By now, they would be moving on with life already. And yet, his final thoughts were not of his family. His mind focussed on blind hatred for the Kryl. He felt everything begin to close in now. The pain had gone, he could no longer move, and paralysis had taken over as his organs began to shut down. He felt his heart beat, slower and slower and then nothing as finally a dark mist began to cloud his mind. This was it. He had nothing left and it was all over. Move over Vampires... Space is Back! The final book of the first Alpha One trilogy will be published traditionally by Eternal Press on 1st November, 2013. On Earth, as Alpha’s leaders go into hiding, President Roslyn has no choice but to comply with the Kryl agreement. Every three months, three hundred million humans must die. As promised - a second excerpt! Three days after his friend, Stefan had been taken, Muller witnessed a further twenty-five of his fellow humans taken away for ‘processing.’ He knew his chance of freedom was gone. He had begrudgingly and finally resigned to his fate and prepared for the end of his life. And yet now he would have to wait another day... In two hours time, he would hear the screams from the death chamber, which obviously lay just a few metres beyond the edge of the compound. Then there would be brief normality as people went about their business, just as they had done for the last three to four weeks. By dinner time, reality would strike again as they realised that this could be their last meal; a growing feeling of resignation, that built up as the evening turned to night and they took to their beds. Sleep was not really on the agenda. When you knew you could be in the last twenty-four hours of life, your body and mind rejected sleep, it was an irrelevance and yet killing time by sleeping would have been the choice of most of the remaining humans in the compound. Dieter Muller woke from a mild slumber at eight-fifteen am; just as he had done for the last three mornings. He did not get up, there was no rush. Hey what shall I do today?, he thought. In an hours time, he would know; was it today or did he have another twenty-four hours of life? He looked around. Surprisingly, the compound was a hive of activity; people going about their daily routines, some exercising, some washing, brushing their teeth. Why? What was the point...? I’ll brush my teeth after they have called today’s sacrificial lambs. Dieter moved himself into position in the recreation area, so he could see when the Kryl guards came through the doors to the front. The exit doors to the left of the main door were where the selected persons would shortly be led. A few seconds later, the two guards entered the compound. Both guards moved into the crowd, purposefully heading to their first intended target. The first one reached an elderly woman, he stood in front of her and she sighed and resigned to her fate, followed the guard towards the exit door, where she was led through, before the guard turned back on his heals in search of his next victim. There was complete silence, as the guards moved amongst the crowd. Each chosen person was confronted and led to the exit, with the guards once again seeking out the next human. Philip Dubois was the next person to be selected. The two people he had been closest to, whilst entrapped within the compound had now been taken. The process was drawing to a close and Muller was about to move back inside, resigned to another day of purgatory. But, then he realised, the last guard had come back for his twenty-fifth victim and was heading toward him. Today that person was Dieter Muller. As the guard reached him, Muller raised his head and remained still, a weak gesture of defiance. There was nothing he could do now. His time had come; but he would make them work.... The guard gestured him towards the exit, but still Muller stood his ground. After a few seconds further, frozen in time, the guard produced a half metre long plasma stick, charged with electricity; the threat of it being used sufficient to end his last stand. He reluctantly moved forward through the compound and through the exit door. Muller entered the next room; a waiting room with a door at either end and a bench seat running down each side. The condemned obviously sat here, whilst they waited for their sentence to be carried out. Muller joined Philip Dubois, who sat at the front end of the chamber; the end nearest the death room, or so Muller assumed. The remaining guard carried on through and left the room. They were alone. It took a few minutes for the conversation to start. “Can anyone believe we are actually doing this? We are about to give our lives because our government says that this is acceptable?” The question came from the other end; a balding, but fresh faced man, who looked too young to be over sixty. “We are making the ultimate sacrifice to protect our species going forward”. The reply from an older man, who sat in the middle on the same side as Muller. Now the whole group joined in. The tension broken by an opportunity to let off their frustration as the conversation became more heated. Several of the younger men stood up to face up to their opposing number, before Dieter Muller intervened. He pulled himself up onto the bench and stood and shouted louder than everyone else so that no-one was in any doubt as to who they should be listening to. Muller stepped down and the balding man raised his right hand. Several responses came at once and Muller raised his voice once again. A second man raised his hand and Muller acknowledged him. The bald man raised his hand again and spoke without delegated authority. Another man stood up and raised his hand, but his reply was drowned out by a sea of voices as once again, Muller was forced to intervene. Muller sat down and nobody replied. There was muted acceptance that he was correct. To resist now could sentence them all to an even more painful death. Gradually all the protagonists began to make way and sat down. Muller waited until the last man had sat, before he took himself back to his spot next to Philip Dubois, who curiously had stayed quiet during the whole process. Now it was his turn to speak. The Administrator worked carefully through the error transcript. Twenty –five pages long; these were the names of those selected whose details had been misplaced, misspelt or where information was absent. These were the few from the list who without complete information, would fall through the net and ironically would be saved from the Kryl’s clutches. Any entry where the information could be verified would then be added back to the database. It was a laborious task, but the Administrator was a professional and if this had to be done, it had to be done accurately. The computer generated database was full. Five hundred million names selected at random from the ECG Central database, all with the same unique characteristic; Every person on the database was over sixty years of age and as such they were all eligible for selection. They had received instructions to build the database just fifty-four hours ago and Colm Mackenzie had quickly gathered his senior team, cancelled all leave and pulled in supplies for an in house sit in; their brief to generate and circulate the list within seventy –two hours. There had been little time to question the rationale behind what they were doing. No-one could quite believe how things had come to this and yet they were just the administrators. They played no active part in the selection process. Mackenzie had been circumspect in his initial briefing. He saw how horrified his team members looked when he explained the task ahead, but reasoned they were removed and that he would ensure that none of his team were personally affected. This was a breach of his brief, but how else could he justify the process when each of them could be sending those close to them to their deaths? In the last few days, there had inevitably been protest, but despite his own deep misgivings he had pulled his team back together again and they had continued their task. Now was one of those times and despite his own thoughts battling and conflicting inside him; he prayed there would be no further interruptions. He did not know how much longer his own conscience would allow him to continue. On this occasion, there were no further protests and Mackenzie and his team continued with their task. The next stop was to place an algorithm filter on the list to identify those who had family links, be they children, or grandchildren. Any individuals filtered out would then be moved to a reserve list. Their immediate fate put on hold. For those with no family connections, a further filter would clear a list of one hundred and fifty million names and it was these individuals who would form the first sacrificial humans who would be delivered to the Kryl. Under the powers bestowed on me, by the Kryl/Earth Agreement, you have been randomly selected for Kryl processing. You must deliver yourself to the nearest collection centre (......) within 24 hours of this notice. Failure to comply, will lead to the serving of an arrest notice. The collection centres will filter those selected to the final processing list. Those selected will then be transferred to a national collection centre for further processing. Those removed by the filter, will be allowed to return home. Once selected and removed from the final processing list, you will not then be eligible for reselection. Now, all he had to do was to give the ‘send’ command to his workstation and his job was done... But he needed a little more time. His team left in silence. He waited patiently for the last team member to leave the access portal, before turning his attention back to his workstation. He took another few moments to compose himself, turning away from his desk as he contemplated the enormity of his next actions. What was he about to do? This list was about to condemn one hundred million people to their deaths and he had generated the list. Was he complicit in this crime... a crime against humanity? He took a deep breath and shifted uncomfortably in his seat. At least this way I know my loved ones are safe. If I leave this to someone else, then I cannot protect them. This final thought drifted through his mind as he turned once again towards his work station. This simple voice command confirmed the action and within milliseconds one hundred and fifty million people would know their fate. Mackenzie’s task was done. It's a dangerous place out there! Which of course we are, ultimately but I think the consensus is that it could be a few billion years before we need to start worrying about the universe folding in on itself . Of greater concern though is our relative inability to detect comparatively large objects which may be on a collision course with Earth and remain undetectable until just a few hours before they impact. We know about the big ones, we can see them and have been tracking them for many years; it's those which are big enough to hurt us but still too small to be detectable which we should be concerned about. If one of those hits us in the wrong place, then yes we could be looking at an Extinction event. It could be all over in just a few short days and right now we are powerless to do anything about it. Or are we? I am not one for conspiracy theories. I have no doubt that man did set foot on the moon in 1969 and that Elvis is dead and he has been since 1977. But surely our great leaders, appreciating the significance of such a risk to our planet must have put something in place to protect us? Surely they saw Armageddon and Deep Impact? Up there somewhere there must be both Russian and US missile arrays pointing away from the planet and out to the cosmos. Perhaps China and Europe have systems too. Surely, their scientists have told them how great the potential is for another extinction event and have they behind closed doors reached global consensus for a worldwide anti-meteor defence policy? Of course they would not want the world to know would they? That they had spent billions on a planetary defensive system, dwarfing the costs spent on global defence just to ensure that we all survive? Or may be they have done nothing... Ok I am not advocating dropping the welfare budgets so they can build a huge defence system for something which probably won't happen in the next ten thousand years, but surely they must be doing something to aid the detection of these rogue chucks of rock. History tells us we need to be aware of them and we have the technology, we must be able to detect all but the small harmless ones. The post Space Shuttle age has not exactly panned out the way it was expected. Probably as a result of the economic downturn of the last few years, we have seen first NASA reduce its mission expectations and now ESA, who meet today in Italy to determine mission budget allocations for the next five years. Realistically, the budget for ESA is expected to remain flat, with certain countries (notably the UK) looking to invest more and some less. Where ESA will need to spend more is on the Ariane 5 and more importantly the expected replacement, the Ariane 6. With the US's SpaceX company now threatening the Arianne 5 on price, investment will have to be made in the short term to keep the Arianne competitive. So what would NASA and ESA spend it on if they had the money? Ultimately in Europe as in the US, we are seeing a shift away from the nationalised space projects, in favour of the commercial utilisation of space and this can only be a good thing. There are numerous companies involved now with the development of new space vehicles, satellites and drive mechanisms and progress made on fusion powered engines in particular in the last decade, is very exiting. Let's be clear we are not talking about warp speed. We are not even talking about a realistic journey time to our nearest stars, but progress nonetheless and once and if these new power sources become commercially viable, then the new breed of privately funded space companies will power this forward. It will then become a realistic proposition to send a manned crew to Mars, Jupiter and even beyond that. Perhaps then the space age will be back on track. Welcome to the World of Alpha One!